A song of denial by the wonderful songwriter, educator and human being - Bob Blue. Our sons learned this first, and we learned it from them. 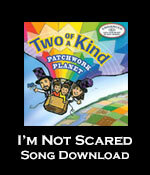 We asked them if they wanted to sing it on our recording, but they preferred to do the sound effects - this time. We had fun giving this song a Klezmer feel.